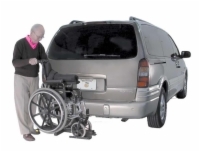 The lifts shown here are designed for transporting manual wheelchairs on your car, truck, van, or SUV. Most manual wheelchair carriers will hook up to any class of ball hitch mount, draw power from your vehicle's battery, and support around 100 pounds of weight. If you only require a carrier for a simple manual wheelchair, this is an excellent low-cost option. Call one of our wheelchair lift specialists today to hear the deals we have to offer! We have the lowest prices anywhere and free shipping, so nobody will beat us!